Heavenly and merciful Father, I can no longer make it alone in this world. Lord, I need you each and every second, every minute, every hour of my life. Continue to walk beside me and mold me as I progress, and strive to become a better, stronger person in You. Guide my actions, my thoughts, my words, my deeds. Allow me not to yield to temptation. Yeshua, the battle against temptations is so strong, I struggle at times to fight it. Give me strength, Oh Lord, to walk away from the evil that tries to lure me in. Father, cleanse my mind, body and soul of anything that is not pleasing to You. Help me to follow in the footsteps of Christ and keep pure and holy, for my body is the temple of the Holy Ghost. Lead me to the cross, Oh gentle Savior. Rid me of myself because I belong to You. In Your presence is where I want to be. 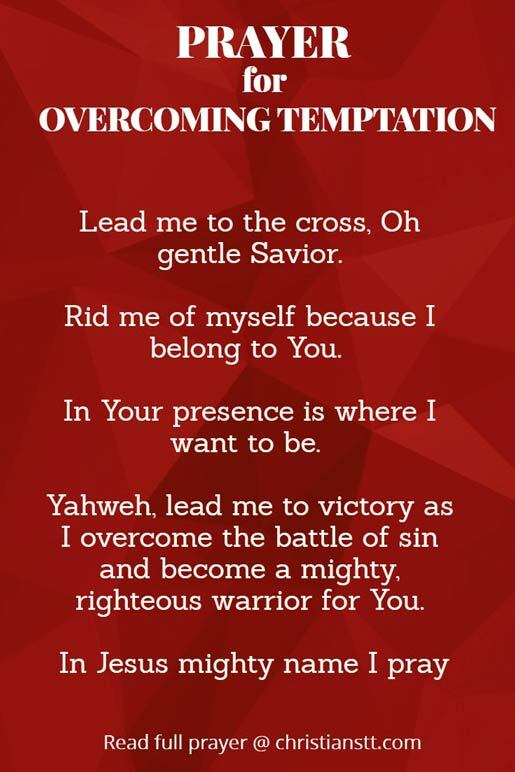 Yahweh, lead me to victory as I overcome the battle of sin and become a mighty, righteous warrior for You. In Jesus mighty name I pray, Amen! Over to you, now. What or who are you praying for today? Has this prayer been a blessing to you in any way? Join the conversation below!